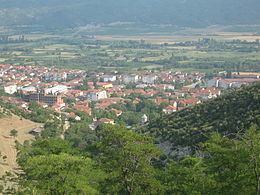 Valandovo (Macedonian: Валандово [vaˈɫandɔvɔ]) is a town in southeastern Republic of Macedonia. The city is the seat of Valandovo Municipality. Evidence of life can be found beginning in the 10th-7th centuries B.C. There is a settlement known as Mal Konstantinopol (Small Constantinople) dating from Roman times, and the life in the Middle Ages is marked by Marco’s Tower. 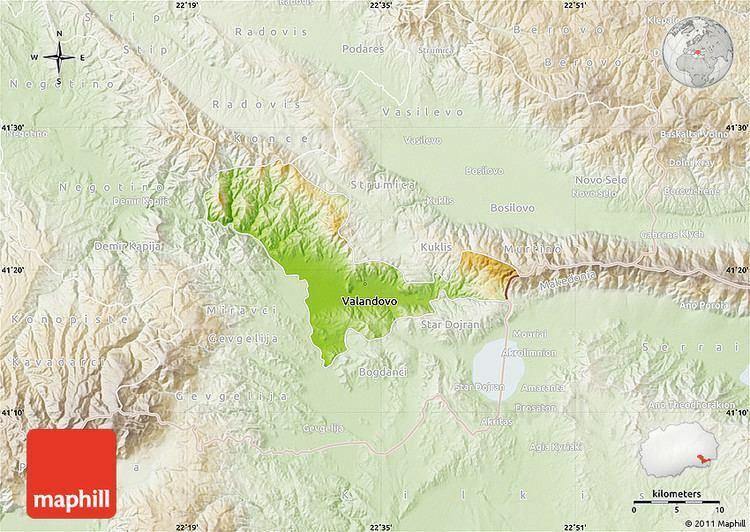 In the vicinity of the town there are also two very important archeological sites – The Isar Marvinci and the knowledge experts have on the existence of the ancient city Idomenae. Also, very interesting and important discoveries are the ancient mosaics of Valandovo, the necropolis discovered near Dedeli dating from the Iron Age, the monastery and the church dedicated to St. George, etc. On the hill Isar, at the village of Marvinci near the town of Valandovo, there is a community from the early antique period that belonged to the southern Macedonian area called Amphacsitida. The many layers of this community speak of permanence with no significant interruptions, where time managed to save the earliest traces of its existence. The hill is 40 to 45 meters high and is located over the mouth of Anska River, flowing into the Vardar river. The Acropolis of the town was strengthened by defence bulwarks. Most of the architectural findings show the existence of profane living objects, while the last phase shows the possible existence of a ceramic workshop. The construction method in the earlier primitive stages, is very different from the latest stages. According to the archeological findings, the town was first ruined in the 3rd century BC, in time of the Celtic invasion in 279 BC. The excavated construction material shows the cultural and economic development of the town throughout centuries of its survival. In the 5th and 4th century BC, stock was imported from Corinth and Ionia, in Asia Minor. Ceramic from the Iron Age was found in the tombs and Greek amphorae from the classical and late Hellenic period. Apart from the imported ceramics from the big manufacturing centers, there are also local ceramic products with native tradition and often simulating Greek forms. During the Hellenic era, the connections with the neighbouring leading cultural centres in Macedonia: Pela, Beroia, Amphipolis and Thessalonica were strengthened. Ceramic plastic, jewels and coins were made in the pattern of these developed centres. The antique town on the Isar secured its economic development through agriculture, cattle raising and mining. The numerous mines in the region, as well as the pottery craft continued as a tradition in the Roman period. In the late 19th and early 20th century, Valandovo was part of the Salonica Vilayet of the Ottoman Empire. In 1913, as a result of the Balkan Wars, the town became a part of the Kingdom of Serbia, which in 1918 joined the Kingdom of the Serbs, Croats and Slovenes. From 1929 to 1941 Valandovo was part of the Vardar Banovina of the Kingdom of Yugoslavia. From 1941 to 1944, during the Axis occupation of Yugoslavia, Valandovo, as most of Vardar Macedonia, was annexed by the Kingdom of Bulgaria. Having an ideal Mediterranean climate, the town and its surroundings give the impression of a large garden abundant with the well-known and tasty Valandovo figs and pomegranates, as well as other early-spring vegetables and fruits. According to the census performed in 2002, the population of the municipality of Valandovo is 11,890 inhabitants. Valandovo is known for its annual music festival in which the best folk singers from Macedonia take part. The first festival started as a result of the continuity of the rich and long musical tradition of this region. It was held in 1985 and became a new tradition promoted from its very beginning. For over 20 years now, the festival has presented valuable music and has gained great national significance. The chief organisers of the festival faced some problems and difficulties from the humble beginnings but nevertheless they never gave up on their idea. The festival was quickly accepted by audiences. In 1989, a summer festival stage with 1,200 seats was built and all performances from 1985 – 89 were broadcast on television and so seen by 30,000 people. Valandovo musical production has issued 35 audio-cassettes, records and video-cassettes. In 1993, the festival was held in Sydney, Australia. The FOLK FEST has been admitted to FIDOV – the World Federation of Festival Organisations, with its head office in Los Angeles, United States. This membership enables a worldwide presentation of both Macedonia and the festival. The festival has also received several awards, among others one by Deutsche Welle, a German radio station, for special achievements among our immigrants.